Frank Holmes, CEO of US Global Investors, reported back from the LBMA/LPPM Precious Metals that took place in Barcelona last week. Holmes gave the key note address on Day 2 "Quant Investing: From Gold to Cryptocurrencies." According to a thrilled Holmes, his presentation was voted the best – no doubt helped by the topical subject matter – and he was the recipient of an ounce of gold. He went on to relate the views of the conference attendees regarding the relative performance of gold and cryptos should there be (heaven forbid but sadly topical) a conflict involving nuclear weapons. "Speaking of gold and cryptocurrencies, the LBMA conducted several interesting polls on which of the two assets would benefit the most in certain scenarios. In one such poll, attendees overwhelmingly said the gold price would skyrocket in the event of a conflict involving nuclear weapons. Bitcoin, meanwhile, would plummet, according to participants—which makes some sense. As I pointed out before, trading bitcoin and other cryptos is dependent on electricity and WiFi, both of which could easily be knocked out by a nuclear strike. Gold, however, would still be available to convert into cash." Unsurprisngly, the conference attendees gold voted gold as the superior store of value – a view which echoed the recent Goldman Sachs primer on precious metals. Goldman asked whether cryptos are the new gold and concluded "We think not, gold wins out over cryptocurrencies in a majority of the key characteristics of money…(precious metals) ****are still the best long-term store of value out of the known elements." However, there is obviously a difference between a superior store of value and shorter-term upside…and Holmes is far from bearish on bitcoin and other virtual currencies. One of his observations is, alas, only too relevant for many gold investors that "**Because they're decentralized and therefore less prone to manipulation by governments and banks - unlike paper money ****and even gold** - I think they could also have a place in portfolios. He goes on to aim a couple of blows on Bitcoin's biggest recent detractors "Even those who criticize cryptocurrencies the loudest seem to agree. JPMorgan Chase CEO Jaime Dimon, if you remember, called bitcoin 'stupid' and a 'fraud,' and yet his firm is a member of the pro-blockchain Enterprise Ethereum Alliance (EEA). Russian president Vladimir Putin publicly said cryptocurrencies had 'serious risks,' and yet he just called for the development of a new digital currency, the 'cryptoruble,' which will be used as legal tender throughout the federation." "Metcalfe's law states that the bigger the network of users, the greater that network's value becomes. Robert Metcalfe, distinguished electrical engineer, was speaking specifically about Ethernet, but it also applies to cryptos. 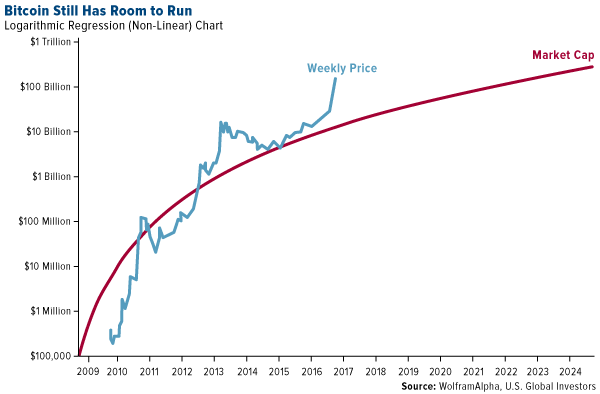 Bitcoin might look like a bubble on a simple price chart, but when we place it on a logarithmic scale, we see that a peak has not been reached yet. "The study measured the value of the network based on the price of relevant digital currencies and compared it to the number of unique addresses that engage in transactions on the network each day, according to the abstract. The results show that 'the networks were fairly well modeled by Metcalfe's Law, which identifies the value of a network as proportional to the square of the number of its nodes, or end users,' the study says…The application of Metcalfe's law towards transaction numbers specifically has long been suggested, with a fairly strong correlation between the price of digital currencies and their transaction numbers observed over many years. Ethereum, for example, was barely handling 20,000 transactions at the beginning of the year. Now it manages nearly 300,000 a day. Likewise, price has risen some 10x during the same time period. The reason for this relationship is fairly intuitive. As more projects build on ethereum, more users find it useful as there are more things they can do with it, which in turn makes ethereum more useful for new projects as it allows them to tap into more users. The same can be said about merchants. As more of them accept eth for payments, more think eth can be useful for everyday things, which means more merchants want to accept it to tap into the increased number of users, so forming a virtuous cycle. Metcalfe's law of network effects can be applied to developers too, or investors, including speculators. The more that use it, the more useful it becomes, with the reverse applying too. The fewer individuals that use it or the more that stop using it, the less useful it becomes." If that was his killer chart, however, this was perhaps his killer comment. "Bitcoin adoption could multiply the more people become aware of how much of their wealth is controlled by governments and the big banks." This was among the hallway chatter I overheard at the Precious Metals Conference, with one person commenting that what's said in private during International Monetary Fund (IMF) meetings is far more important than what's said officially. We have a similar view of the G20, whose mission was once to keep global trade strong. Since at least 2008, though, the G20 has been all about synchronized taxation to grow not the economy but the role government plays in our lives. Trading virtual currencies is one significant way to get around that. Good post. I think Metcalfe's Law is applicable to bitcoin and other cryptos. A lot of detractors like Jaime Dimon have ulterior motives in trashing bitcoin. There are some intelligent people who are also skeptical of bitcoin that are probably sincere, but not have taken the time to really understand the technology. According to some respected hedge fund managers like Mark Yusko, the smart money on Wall Street is now moving into cryptos, and we are seeing an increasing number of hedge funds created to invest in the space. We are still a long way from the general public investing in even bitcoin. I believe that as larger amounts of money are invested in crypto assets, causing their prices to rise, that will have a cascading effect leading to even more money coming into the space because there will be a fear of missing out (FOMO). Japan has made bitcoin legal tender. We are also seeing the increasing use of bitcoin in countries like Venezuela and Zimbabwe that have unstable currencies. People in those countries who have had their wealth destroyed by the devaluation of their currencies recognize the safety and other benefits afforded by bitcoin. As this recognition spreads and more important people in finance acquire bitcoin, it's hard to see how governments will be able stop the spread of cryptocurrencies. I certainly expect them to regulate cryptos, which will be good because it will lend more credibility to the space, but governments will not be able to kill them. You can't stop progress. Hopefully people would move to privacy coins from BTC. Without privacy governments can track our cryptos. I mean they already track our internet activities. It's not too hard to figure out who owns which. The privacy feature of Dash has never been broken compared to the entire mess that's Monero. PIVX recently implemented zerocoin privacy. So I think it's best to use PIVX or Dash. I've also heard good things about Verge. As always, Do your own research. Let the BTC buyers know how important privacy is and make them buy privacy coins. I'm sticking with Dash and PIVX. No need for Zcash as PIVX has the same tech+instant transactions+self funded treasury. Metcalfe's law is central to crypto currencies. Actually, while not called that, it is needed for any currency. Adoption is the key aspect. Unless a large number of people have it and are using it, a currency has no value. So the more Bitcoin wallets out there, the better. Another aspect is the number of developers on the network creating and developing interesting apps. As I stated repeatedly, the bitcoin blockchain has a huge jumpstart in this area. This means that there are more developers on this chain than any other. I wrote an article yesterday that talked about the Wall Street money that will enter the crypto world, especially Bitcoin. This will only serve to draw in more developers.